I'm Dan. I make websites, for fun and for a living. I'm really good at UI design and implementation. I can also architect a decent database, and program in a variety of server-side technologies. ASP.NET is a buddy of mine, and I do alright with Python, so long as Django mediates. PHP is another of my friends, and I'm still getting to know Ms. Ruby, though I'm sure she and I will get along famously together. I'm 26 years old, I live in Louisville, KY, and I'm always looking for a new project to work on. So if you've come here under the pretense of requesting my services, read no further, just hit the contact button and say hello! I'll get back to you in a jiff. I'm currently attending college at the University of Louisville, pursuing a Baccalaureate of Science degree in Business Computer Information Systems, with a focus on Web Applications Development. I'm also a musician, as well as an avid gamer in my off time. 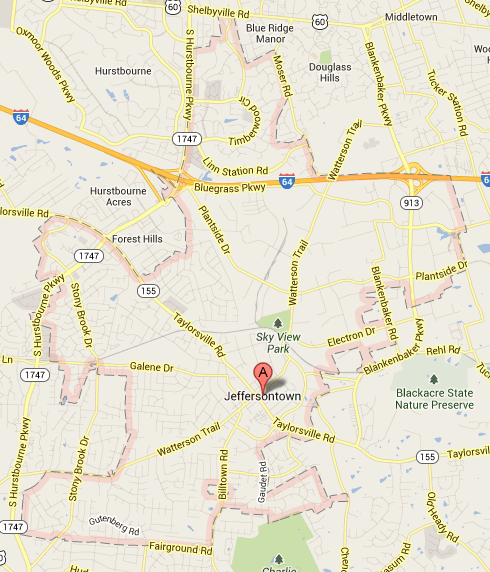 If you're intereted in that side of the house, friend me on facebook. 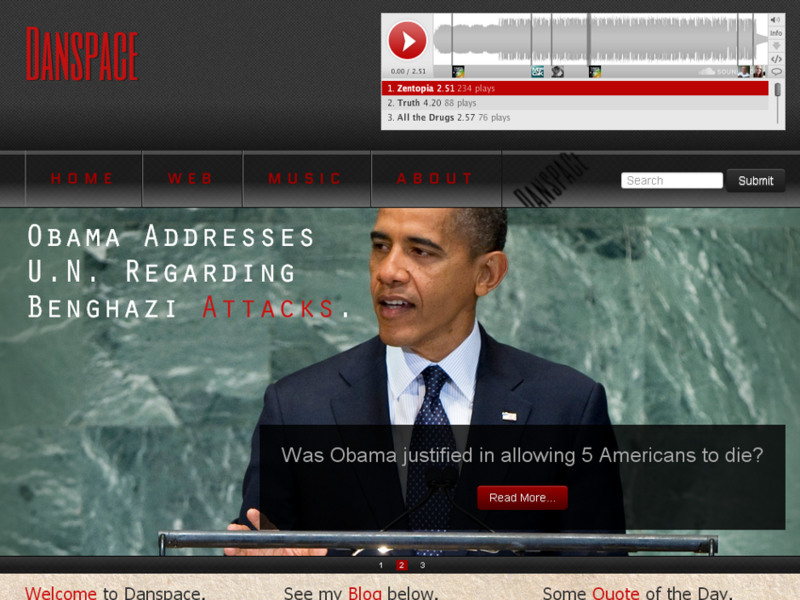 Click a snapshot image above to see the layout detail. I conceived this website to assist students in my training program in the Air Force. I was in an iFrame mode at the time I created this. 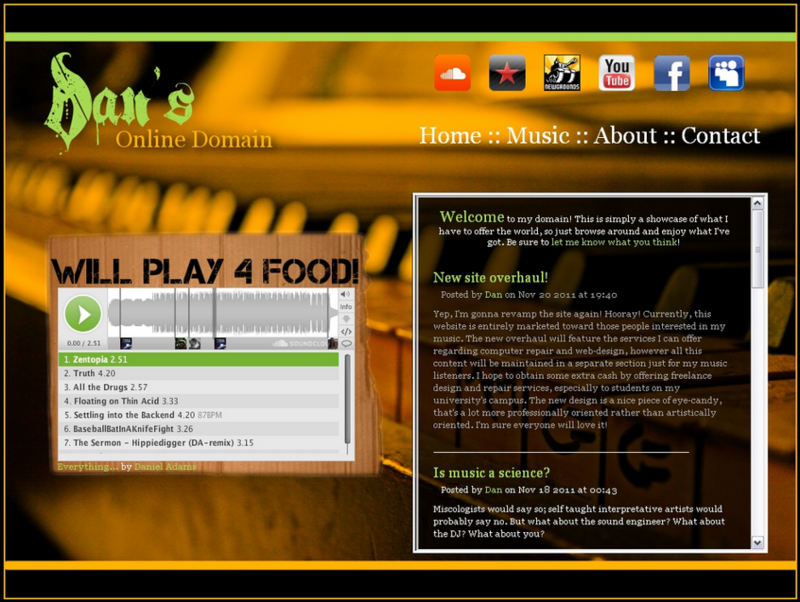 Many developers and designers abhor the idea of an iFrame, but I think it has it's place, as evidenced in this layout. To this day, I think a scrolling <div> populated with an asynchronous AJAX call can serve a noble purpose, if it's used correctly. 4T0x1 featured poll and forum systems, which were implemented to encorage active communication between journeymen and trainees. The primary focus of the site was to provide a broad knowledge base which trainees could reference in order to bolster their education as laboratory technicians in the Air Force. The site is no longer active. Bloody Sumo is an alternate identity I assumed to produce music. I figured it might be a good idea to hide my real name, just in case no one liked my tuneage. 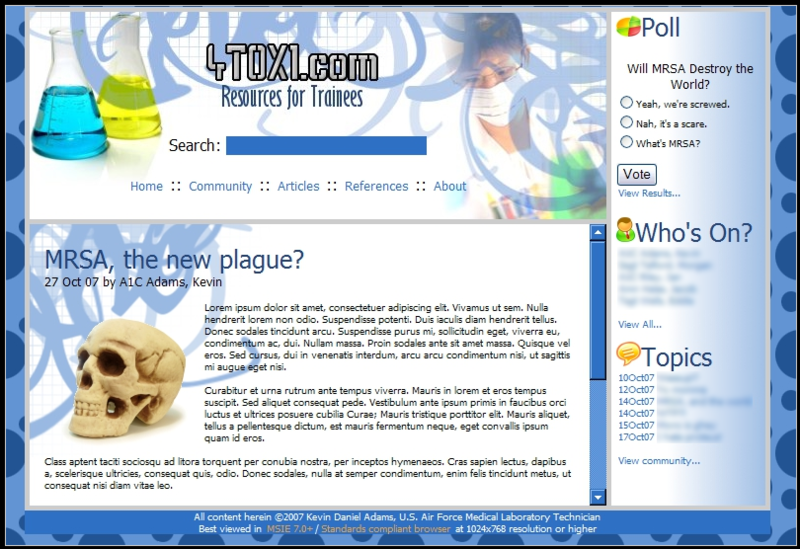 This site was simply HTML and CSS, but it features some interesting design techniques which I was experimenting with at the time. Ultimately, it is a good mile-marker in the history of my learning process as a web developer/designer. Why Bloody Sumo? How does a sumo get bloody anyway? Well, in one of my musicology classes, our instructor had a foam stress reliever which was painted and shaped to appear as a sumo wrestler. Us students used to play around with it, throwing it at one another for fun. It got torn up, and so I decorated it's missing limbs and places where it was torn with a red marker. Voila, bloody sumo. It was such a novel and niche idea/phrase, that I thought it would be an interesting, striking and unique way of identifying myself. This is another of my iFrame mode layouts. It was actually built on a long since forgotten CMS called FuzzyLime. It's a simple flat-file CMS built on PHP. I loved it, because it was easy to build around, and perfect for this sort of simple application. The layout uses an interesting design technique which was very niche at the time I developed it; a "full screen" background, mixed with a fixed scrolling iFrame. Bandwidth was still of primary concern, so the display is small, fitted for 1024x768px resolution. 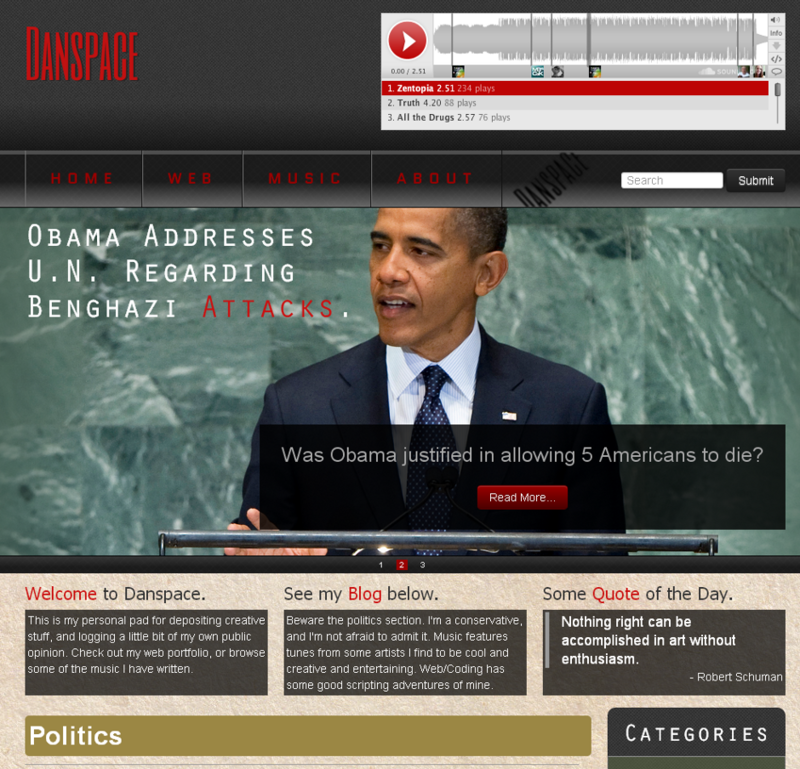 Danspace is another earlier version of the site you see before you. 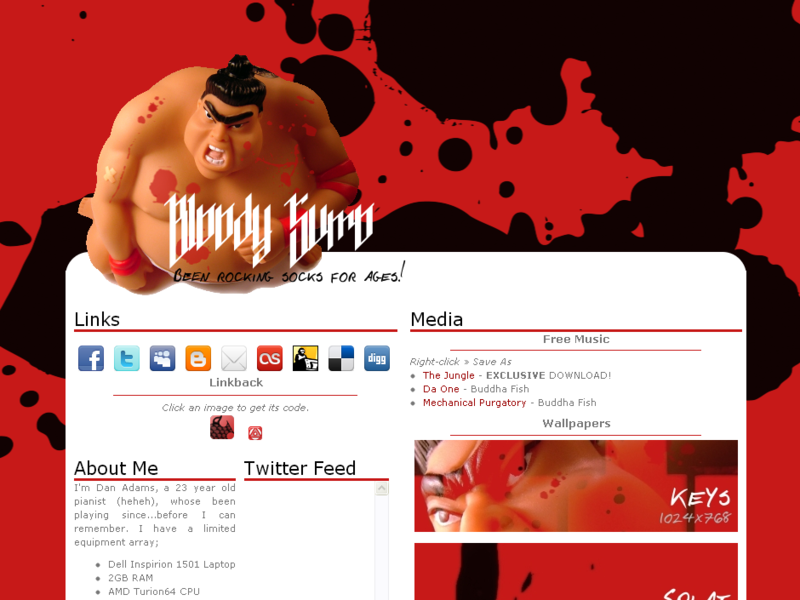 It's a portfolio/blog presented in a single page layout, with my very own, custom developed PHP data transfer layer. It has become the basis for a PHP Content Management System, which I plan to develop into an eCommerce solution. This is an experimental layout I did for my employer's corporate site. The layout was my initial foray into designing on a CSS framework. This one was Bootstrap, but I've used Foundation as well. The landing page features a nifty jQuery slider called Diapo which, sadly, is no longer in active development. 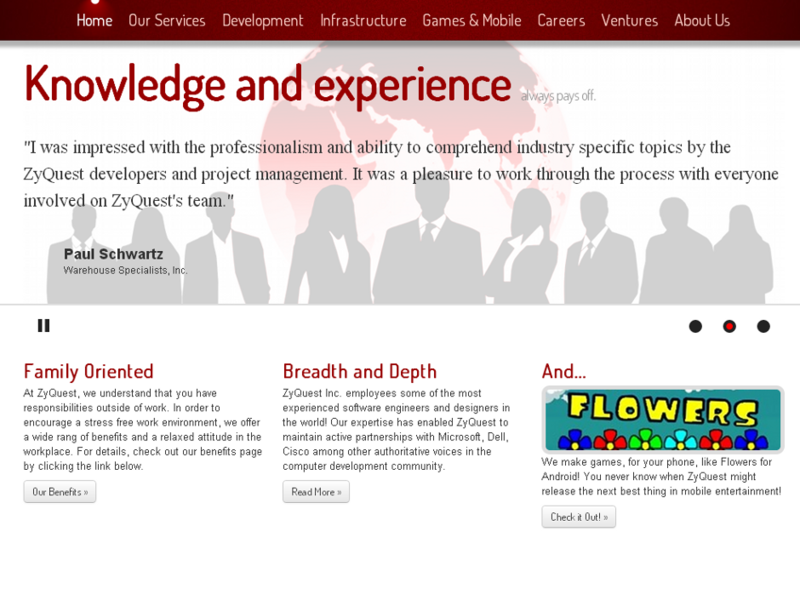 Take note, I claim no ownership over the content within this ZyQuest Inc. layout. It's all owned and copyrighted by the corporation of the same name, especially the snaps and logos of apps, games, and startup businesses, to include ZyQuest's logo itself. Most of the other images are stubs from shutterstock.com.